MainAll NewsForeign AffairsIsrael to UN: Why no condemnation of Hamas attacks? Israel to UN: Why no condemnation of Hamas attacks? Israeli ambassador to UN calls on Dep. Secretary-General of UN to formally condemn Hamas for arson attacks. Israeli Ambassador to the United Nations, Danny Danon, called on Deputy Secretary-General Amina Mohammed on Thursday to condemn Hamas for its ongoing use of arson attacks that have torched Israeli land and terrorized its citizens. In recent weeks, thousands of balloons and kites carrying incendiary and makeshift explosive devices have been launched from the Hamas-ruled Gaza Strip into Israeli territory, where they have sparked hundreds of fires and caused millions of dollars in property damage. 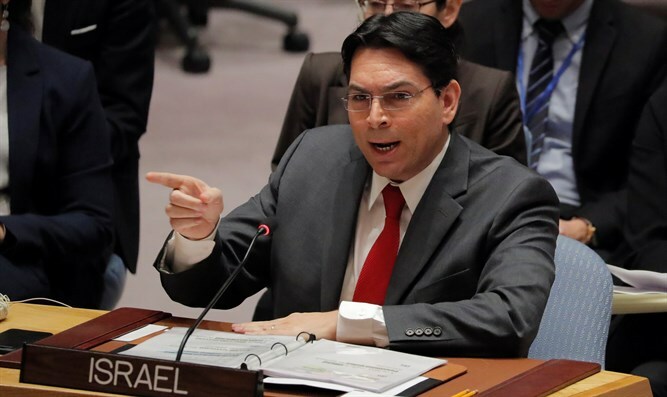 “In the interest of protecting the lives of civilians, their livelihood and the productivity of our ecosystem, I request that you strongly condemn Hamas and hold the terrorist organization accountable for these latest attacks,” Danon concluded. Prior to her current position as Deputy Secretary-General, Amina Mohammad served as Minister of Environment of Nigeria, where she worked on issues related to protecting the environment and conserving resources for sustainable development.